I’m old enough to remember the beginning of the Internet. Like, the old-school whooshing and whirring and buzzing and beeping sent across the home phone line. The home phone line which someone would inevitably pick up, knocking me offline and forcing me to start over. I remember bulletin boards. And chat rooms. I know what A/S/L means. Way back when, and really, it feels like eons ago, I had no idea just how big a role the internet would come to play in my life. And I’m not just talking about blogging and this little corner of the web I’ve carved out. I’m talking about the people. The friends. The bonds forged over the blips and bloops we don’t hear anymore but which are certainly still happening somewhere in the ether. Some of my best friends live in my computer. There’s no doubt that sounds silly if you’re not someone familiar with this phenomenon. But if you’re reading this, you’re probably aware of the friendships–real, solid friendships–that can be made online so no, this probably doesn’t sound silly to you. I’ve been meeting my online friends in my real life world for almost a decade and I’m always amazed at just how easy it feels. How naturally conversation flows. How much deeper those friendships feel as a result when they are once again conducted via computers thanks to that pesky thing known as geography. One of my very first online-to-real-world friendships ended up a bridesmaid in our wedding. We met on LiveJournal with the shared connection of our alma mater to bring us together. Reading those posts now makes me actually laugh out loud, but from those silly diary entries I published to the world came a friend. A great friend. 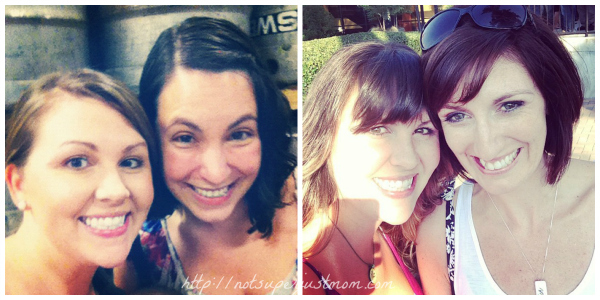 There are friends I’ve met through blogging that I chat with every day. There’s always a chat box open somewhere with a conversation ready to pick up where we left off. We share the good and bad and ups and downs and life and pictures of Ian Somerhalder and parenting and the happy and silly moments. But almost every day there’s conversation, and occasionally, when life permits, there are real-life get-togethers. This weekend, I met a woman face to face (finally) that I’ve known for 5 years. We met on a message board for those thinking about having babies. We ended up pregnant at the same time and due a day apart, both with boys. It felt like I’d known her longer than just 5 years, and 5 years is a long time to know someone. We jumped into chatter about our families and spouses and children and jobs. We drank beer and wine and ate burgers. We laughed. Emma liked her! It wasn’t stuffy or fussy. It was just…friendship. It made me wish I wasn’t separated from all of these amazing people by so many miles. 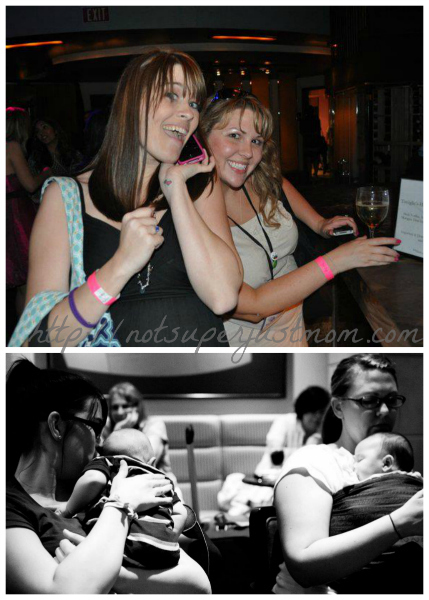 A year ago almost to the day, I met another friend from the same group of women. She is the kind of friend who treks to Target at 9:00 at night to search for a Shoenicorn just because. When she flew out here for a work training, I drove myself downtown to hang out with her. To show her little pieces of my city. And when it was time to drop her off at her hotel after dinner, I was sad because friends like these are hard to find in my three-dimensional world. I had a bigger, grander post in my head when I started writing this, but now I’m just sort of overcome with how thankful I am for the women I’ve met because of this chunk of plastic and microchips in my lap. Or maybe it’s just that I’m even more aware that for all the bad that exists on the Internet, it’s full of so much more of the good stuff. I’m on the interwebz! And live in your computer!! I honestly have to say that I’m so, so, SO happy that we had our little snippets of time together this weekend. Especially seeing you barefoot, in the kitchen, baby on your hip and frying me a chicken. 🙂 I heart you girl, your a bestie for life whether you like it or not. I felt a bit ashamed that some of my best friends lived in my computer. When I went to BlogHer last year and met many of them in person I finally felt like it was okay to develop and maintain relationships through the internet. Also, I may have gigglesnorted at A/S/L. Oh, AOL. How the eff did I miss this post?!?!? I mean, I am pretty sure I know how–chaos of end of summer start of school year back from MI but omg <3 I love it and you!